I’ve been doing plenty of drawings, still. I even finished the pages of a sketchbook, though I can always go back and fill in a few spaces. 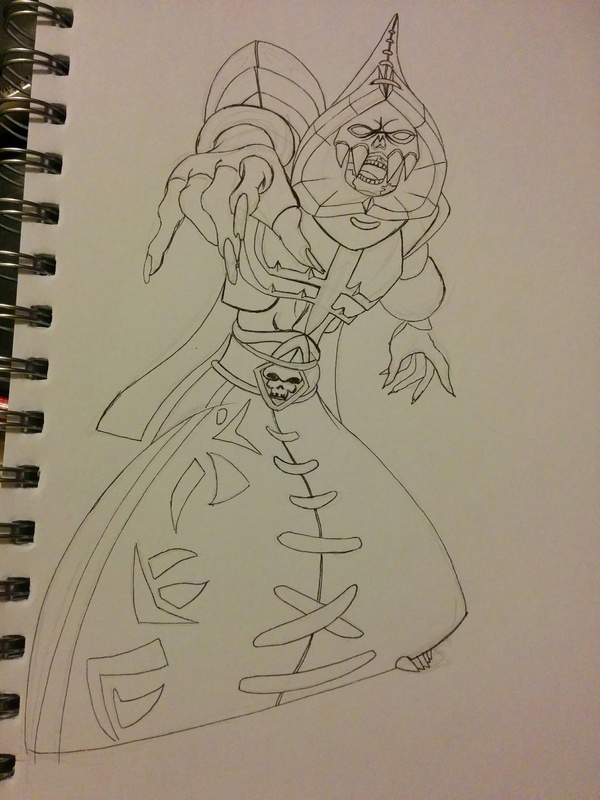 Above is a quick drawing of my partner’s current World of Warcraft character, that’s yet to be finished. I spent my whole afternoon scrubbing a bunch of my clear polymer stamps, so they’d be able to stick to at least the acrylic blocks. I used soap, water and a toothbrush and laid them on paper towel. I then went over them with a baby wipe, before drying them with more paper towel. They were nice and clean for a couple of minutes. By the time I tried to cling them to a laminated sheet, they were furry with dust and cat hair again. So I’ve given up that endeavour. I just need a better way than a lunch box to store them all. Maybe some double sided tape on the back. I’ve used glue dots, which tend to work ok. I found a knitting loom today, and started making something with some chunky, net-like yarn today. It might be a bag. I have no idea yet. 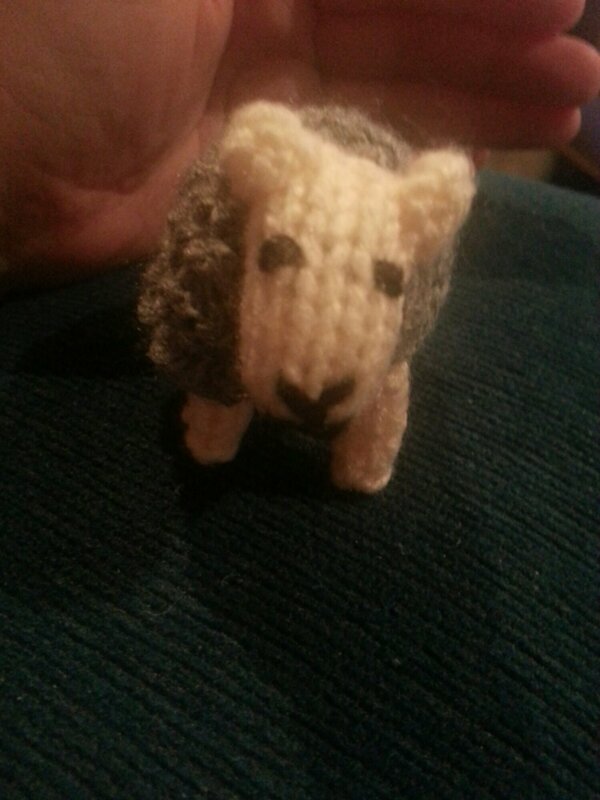 I’ve also done a small amount of needle felting. I just started a simple ball to see how big I can get it this time before I give up. At least my hands smell nice with all the soap I used. Not quite how I had imagined it, as I wanted it to have more height. 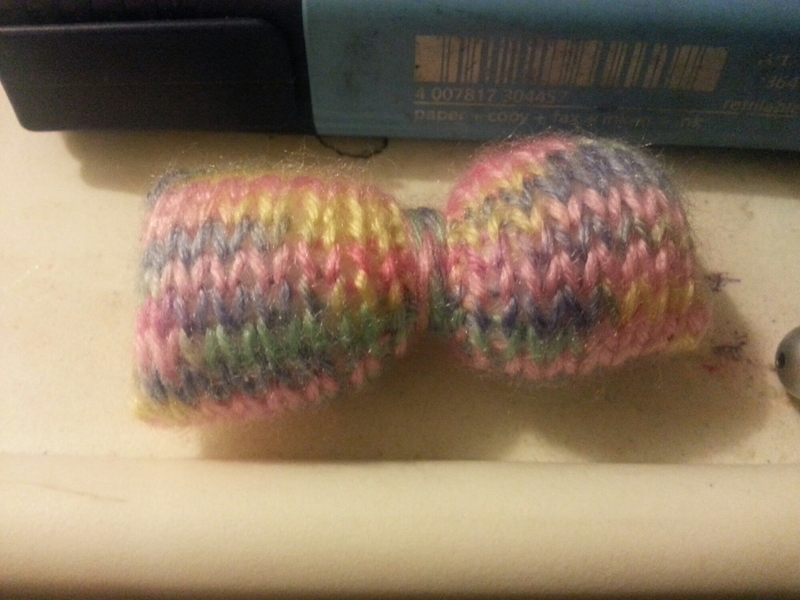 I forgot that knitted fabric acts differently to cotton, where squares make perfect bows. Its still cute, especially when I squish it sideways to be shorter. I also probably should have taken more care wrapping the centre so it looked neat. All things learnt for next time. As for my doll, I began bulking out her arms, and defining the face a little. I’m not sure how much will make it through her skin layer, but thought I could at least block it in to see how it might look and how big I’ll need to make the facial features, etc. Also, making the dents for where the eyes go, so they don’t look buggy, might be a good idea. I want to get a couple more colours of actual wool roving, as I only have red, and would like to play around using actual wool to make something nice. I’ve seen little felted cats made to copy real cats, and that would be great to do of our cats. So many embellishments and charms can be made with felting. It’s and excellent medium, whether done with synthetic, cheap materials, or pure wool roving. Just a quick photo to try and show the actual colour of the wool I’m using. At least the ball is big enough for a scarf and hat…and mittens, and shoes and marker covers… Maybe just a really long scarf. Scarf is slowly getting longer. 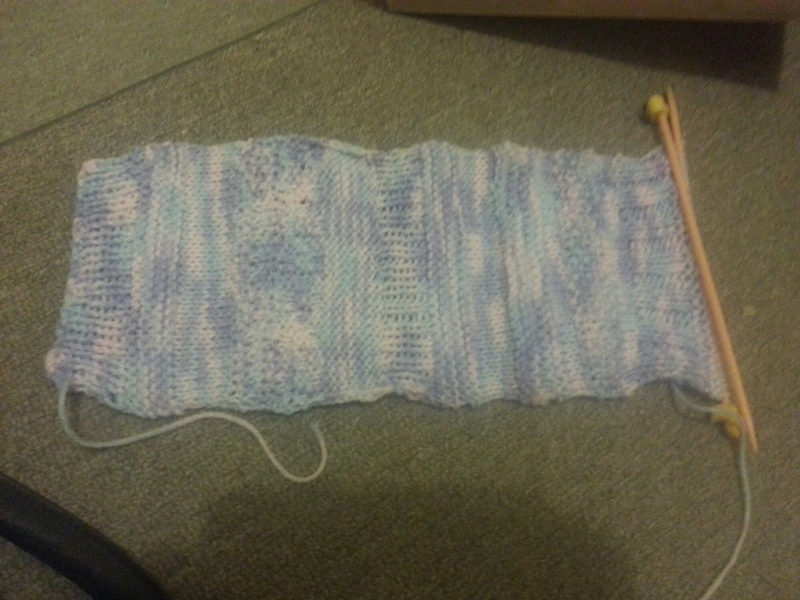 I can only do a few rows at a time, so I’m surprised it’s this long already. 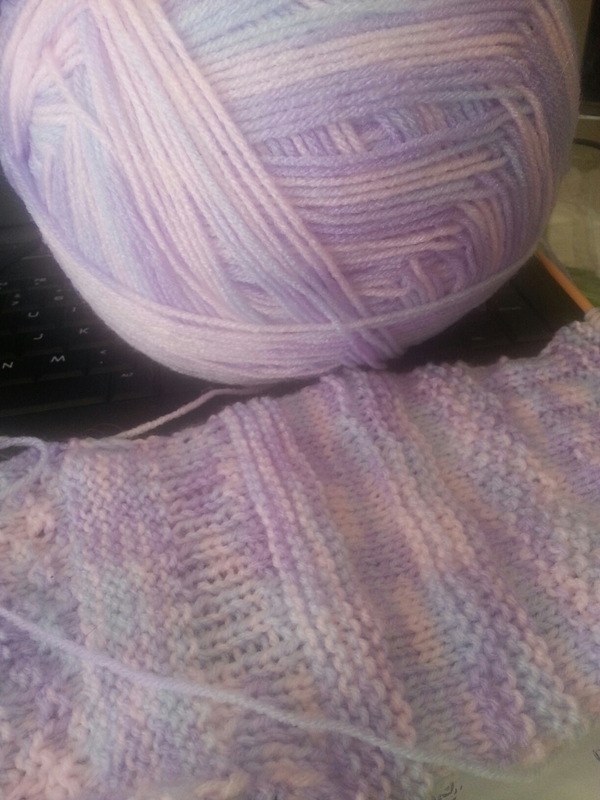 Apparently, I get bored with stitches more often than I thought, as I was expecting at least a few longer blocks. Whatever keeps me going, I suppose. I had to change to my ducky needles, as the metal ones were too long for the project, and kept banging on the computer table. Being plastic, they don’t do the nice click-clack sound properly, but they have ducks, so I forgive them. It is duck season, after all. Today was a massive comedy of errors, mainly ending in injury for me, so I didn’t end up doing too much. It started out ok, with the craft market across the road, I bought a couple of fat quarters for hexagon making, but got too excited and didn’t wash it first. I’ll have to make it into a decorative piece, or risk washing it after its sewn and all the bright lovely colours have the chance to run and make a one colour brown quilt. Curse you impatience. 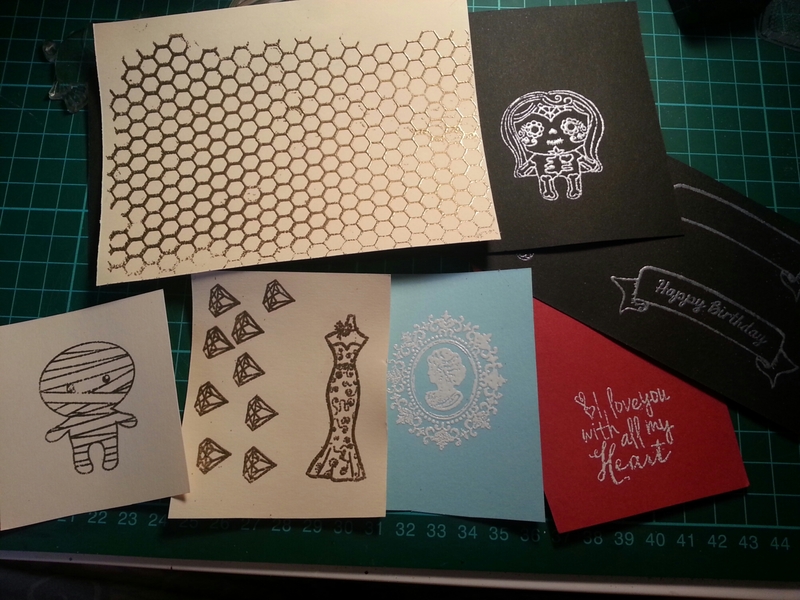 When I got home I gathered together die cutting supplies, and plopped myself in front of the tv for a while. I got to try out my new cutting plates, which seemed a bit different than my original ones, but work just the same. What I also find strange is that us in Australia call yarn, wool. But wool is a type of yarn, and you can have acrylic wool, which is contradictory. It’s a lot like the fries/crisps/chips dilemma, where Australia calls them both chips. Such a strange and confusing place with not enough craft stores. I did a few things today, in the way of crafts. I slept in, so I crafted instead of my afternoon nanna nap. I did some embossing, which is fun. Still using my hair straightener to heat the powders. I have a heat gun on my list, but I’m great at improvising. I had a few problems with the white powders I had. One was rather chunky and lost all detail, but a brilliant white, the other was lovely and fine, but subtle and transparent. It helped to use a white ink pad under the fine powder, but it made it look silver. I might have to invest in some superfine ones, designed for sentiments, as I have a lot of delicate looking stamps. I tried embossing that honeycomb texture from the silicone mat, but I must have pushed harder in some areas and got a bit of ghosting, probably due to the extra squishiness of the silicone. I tried embossing some stamps, which had large flat areas, onto patterned paper in clear powder, with the intension of inking over it, and it resisting, leaving the image patterned, and the surrounding area inked. Unfortunately I messed up three images, before figuring out I had put too much ink and stained the clear image. But now I know, and I could even see some of the pattern through the ink which is fairly nice. Today, I made a thing. 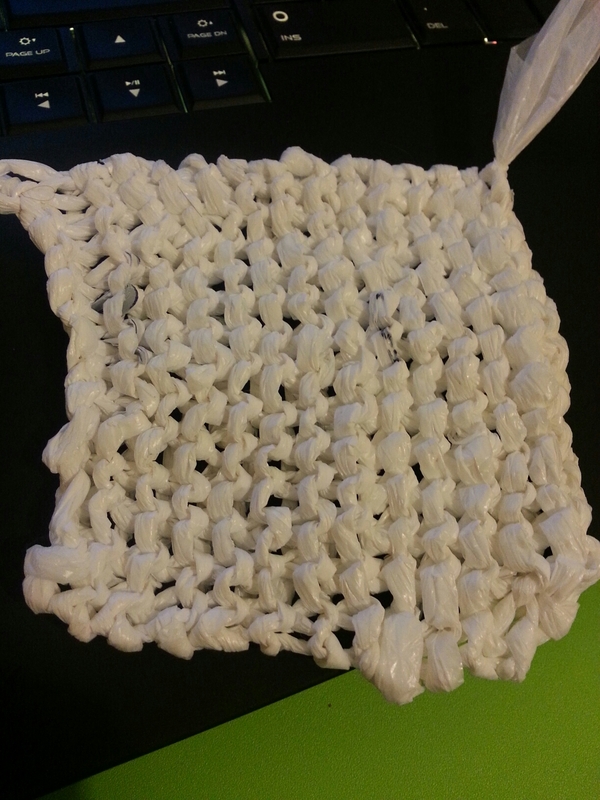 It’s a square of knitting made from a plarn (plastic yarn, which is cut up plastic bags). Yaaay! It has a nice texture to it, and would be suitable to use as a soft scourer for dishes, or to apply texture to products with paint. I originally intended to make a little container out of it, but got bored and ended it before it gets added to my massive to do pile. 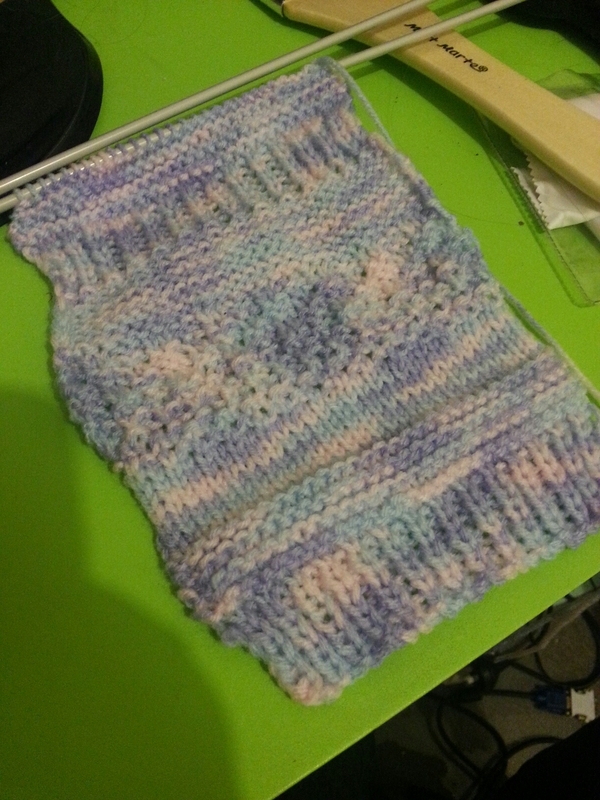 I began the Dr Who scarf. I decided to wuss out and make it thin and on quite large needles. I got thirty rows done before my fingers froze up on me, so it may take a while :(. I can’t wait to finish my craft room organisation, but every time I start, I find projects that I want to work on. Self discipline is not my strong point. While packing, I came across this guy. I made him a couple years ago. So cute. So I’ve been thinking about opportunities and what I should do next. I thought I’d tried everything crafty and arty except mosaics and oils. But then I was thinking about getting something engraved, and thought that would be nice to try, since I’ve practiced calligraphy. So I looked up supplies, cost of tools and metal. Then I looked up YouTube videos. I got three videos in, and I was sick of the grinding noise. So I thought of pyrography. Tools cost about the same, wood is cheaper and more versatile. Less bits of metal to step on and have to chase the kitties away from. As well as no goggles and mask for metal filings. 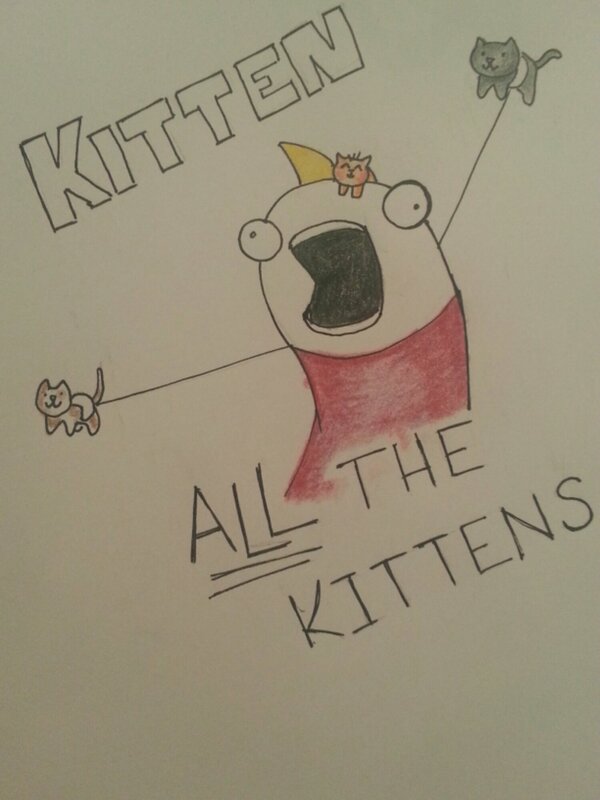 Today I received some good news regarding some small feline creatures, and got inspired to draw this. If you dont know the origin of this meme, please Google “hyperbole and a half” its an excellent blog and needs your attention. The other day I was looking to buy a piece of jewellery for a friend for her birthday. I’m not always attracted to these shiny stands, as I can usually make jewellery cheaper, would rather spend my money on craft supplies, and rarely wear jewellery that isnt sentimental. But while looking, I saw a piece that was knitted in a gold material. It felt as soft as thread, but was cold like metal. It was intriguing. 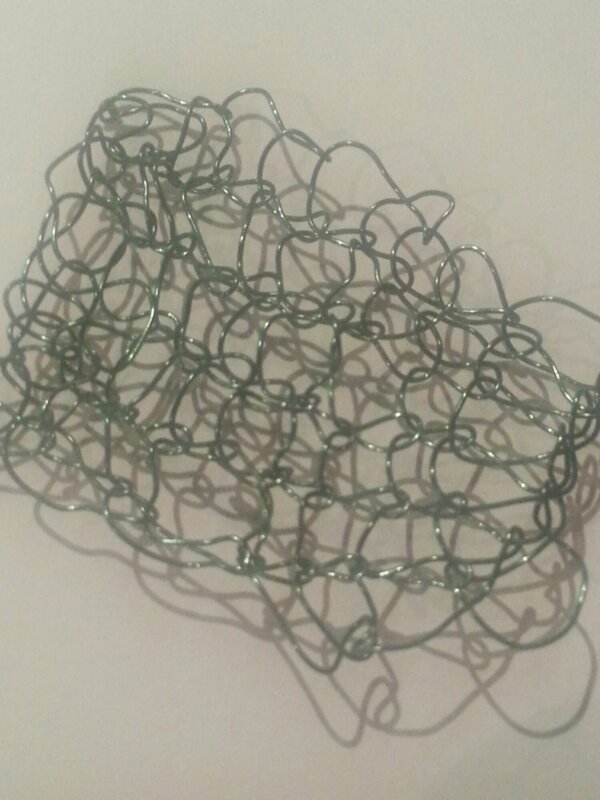 I tried knitting with some thin wire. It definitely did not have the same effect. Looks like a scribble. I thought I might try gold embroidery thread. It may give the right texture and the foil like covering will make it shiny and cool. Hopefully.